Eternal Sunday proudly presents the new single by The Kavanaghs Tonight (Alfredo Norese Remixes) features two remixes of the single “Tonight” made by electronic music producer and remixer Alfredo Norese. 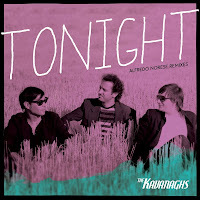 The Kavanaghs are one of Argentina’s top powerpop bands, having toured the UK and USA twice. The original version is featured in the album Love Conquers Pain. The single is a Beatport exclusive release for some weeks.